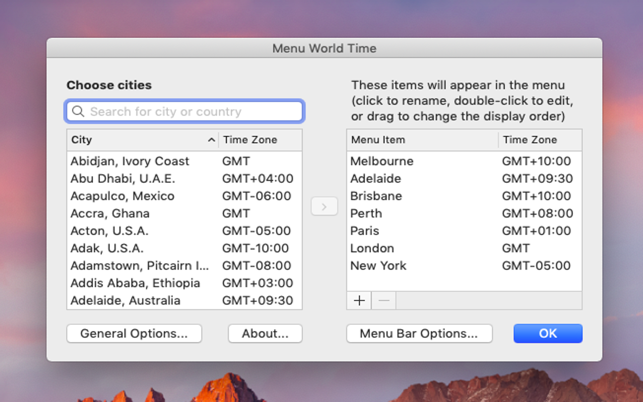 Get times for cities around the world straight from the menu bar. Exactly what I need. Perfeclty succint. One feature request. It’s a clock so it should be lightweight, which it is. 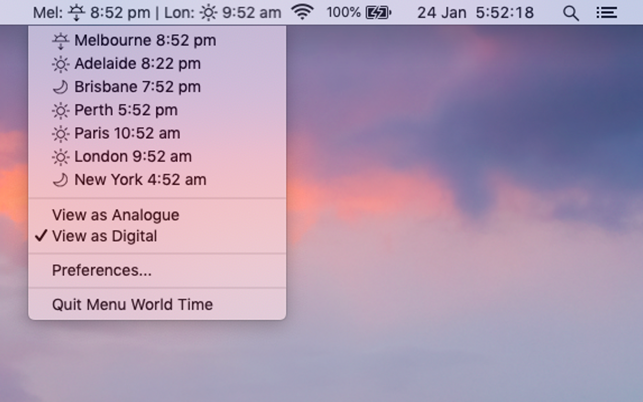 The time-of-day icons are perfect for a quick glance, a feature I was actually looking for. It upholds the look and feel of stock macOS.. and it’s free! 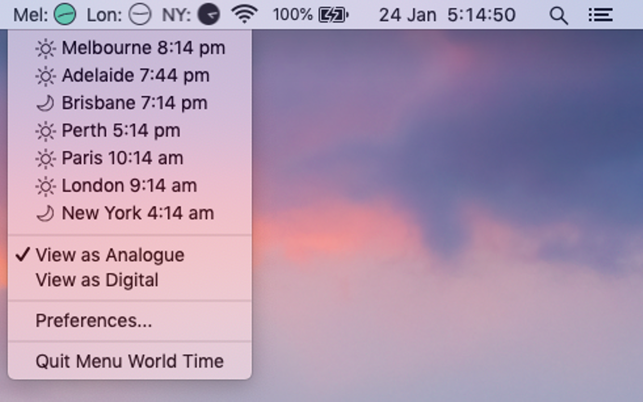 The only feature I’d love to have is the ability to choose a time-zone to display in the menu bar like the stock date and time. Thanks Steve. Appreciate the feedback! Pleased you find it useful. 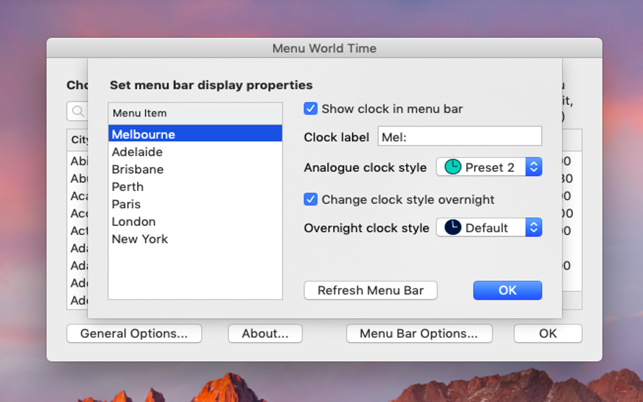 Next version has analog or digital clock options to display in the menu bar for one or more locations which I believe will meet your needs. 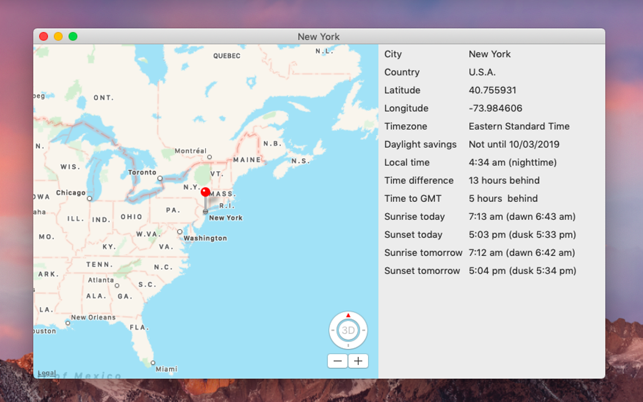 Also has accurate sunrise/sunset/twilight times for each city. Almost finished, so should be available in a week or so. I work outside my companies primary timezone so this helps me cope with time differences especially when travelling and daylight savings time changes are in effect. Once note for developer, according to the "Energy" tab in activity monitor, Menu World Time says "Yes" for "Requires High Performance Graphics" tab. Please rememdy this for battery life. Time Zones not accurate. Have a consultant in Belize City. App says Belize City is CST. It’s not - it is MST. UNinstalled. Zero tolerance for any clock that has inaccurate Time Zones or fails to take into account Daylight Savings Time. If these are fixed then I might give this app another chance because the “Info” page of a given city (map, longitude, latitude, etc) seems like it could be very useful. But first and foremost I require Accurate Clocks. Are you sure? Googling "Belize time zone" gives: "Central Standard Time. Time zone in Belize City, Belize (GMT-6)". Another entry: "Time Zone Currently Being Used in Belize. Belize observes Central Standard Time all year. There are no Daylight Saving Time clock changes." Menu World Time gives: "Central Standard Time, Daylight savings: None". So they all seem to agree.